General piece of advice: don't go around typing stuff into your computer's terminal window based on some pictures you found randomly floating on the internet. 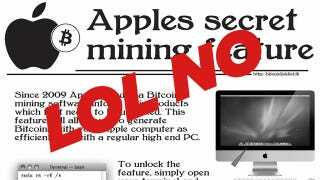 You're not very likely to unlock a hidden bitcoin miner in your Mac, and far more likely to brick the thing instead. If you have any idea what "sudo rm -rf/*" means, you're probably already snickering. If not, well, it reformats your whole machine. Trying to con folks into deleting everything they have is a prank as as old as computers, but it seems this recent (topical!) iteration bubbled up from the depths of 4chan's /b/. And while it seems too ludicrous to believe that folks are falling for this, the Daily Dot has scooped up evidence that suggests a few have, or at least went out of their way to fake it.